The tally of birds seen in our garden over the year stands at 72 different species – the same as last year. I have reported a few times on the ups and downs of the Lesser-striped Swallows, the first on my list this year. So far this summer they have not had good fortune as their newly completed mud nest broke soon after completion and they have not returned to repair it. Perhaps they have really given up this time and found a better place to build. There are plenty of them around though and they, along with the White-rumped Swifts, wheel and dart about the sky in the late afternoons hawking insects and twittering from afar. A Jackal Buzzard is the last on my list. We have watched it on several occasions being mobbed by smaller birds as they valiantly try to chase it away. One has regularly been seen sitting on a pole on the narrow road that bypasses the town behind us. It is probably the same one. For interest I compared this month’s list of birds with that of December last year. Five birds from then have not appeared, while there are eight ‘new’ ones. The most prominent of these is the Knysna Loerie. At least one pair of them seem to have adopted this area as their home territory for we hear and see them almost daily now. 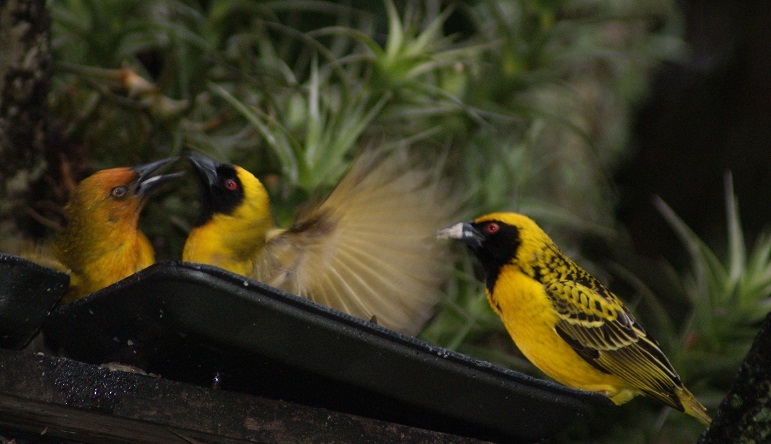 Streaky-headed Canaries are seen more often too, happily competing with weavers, doves and sparrows for seed. 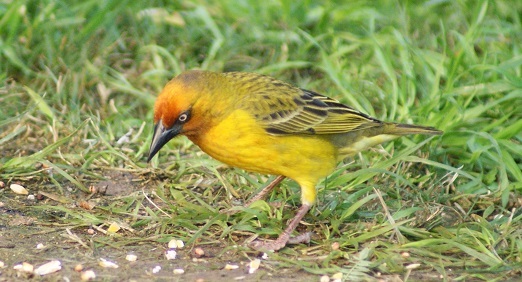 Feeding among the more common Village- and Cape Weavers this month have been Spectacled Weavers and Southern Masked Weavers. This has been a hectic month for the birds in our garden. Village Weavers seem to be feeding their chicks daily; the Olive Thrushes have successfully raised their speckled young to the point where the latter are able to fend for themselves; and the number of Laughing Doves feeding on the lawn has noticeably increased during the course of the month. For some time now I have noticed a pair of Blackeyed Bulbuls stuffing their beaks with fruit to feed their offspring in an out-of-sight nest, possibly situated in the neighbouring garden. Two days ago they took turns flying into the bushes next to our swimming pool. This ‘relay feeding’ was repeated several times yesterday until the youngster was at last enticed to fly to the feeding tray. There the parents found it much more convenient to take turns helping it to feast on the pear. The Lesserstriped Swallows some of you have shown such a shared interest in have, thankfully, successfully raised at least one chick. I saw all three of them twittering on the cable nearby and only a day or two later a chunk of the bowl of the nest broke away. The birds obviously do not need the nest anymore and I imagine that they will soon join others for their migratory trek northwards. Streakyheaded Canaries were the first on my list this month as I spotted a pair of them pecking at the base of the orange tubular flowers of the Cape Honeysuckle (Tacoma capensis) that forms a screen outside the kitchen. 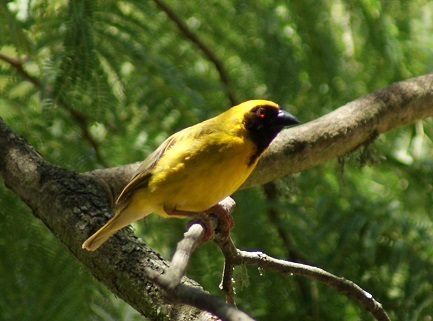 I first observed these birds in our garden about ten years ago. They had become regular visitors by then, having been noted throughout the year. I see them often when the wild figs are fruiting and they occasionally nibble at the apples, pears and oranges I put out. During the winter they feed on aloe flowers – the pollen-rich stamens and anthers are a good source of protein – and I occasionally see them eating birds seed. They do not appear in great numbers anymore, however, and when I do see them it is mainly in the back garden. The Sombre Bulbuls have returned, as have a few Yellow Weavers – I never see the latter in great numbers. I’m pleased to report the Pintailed Whydah pops by now and then. 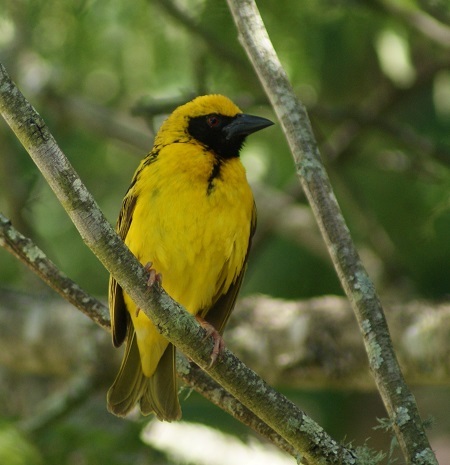 Usually this is a single male or a couple of females, although I recently saw two males perched in the acacia tree – not for long though. A Grey Heron made a brief appearance and I was thrilled to actually see a Brownhooded Kingfisher – I heard its calls last month, but never saw one. It was equally pleasing to spot a Cardinal Woodpecker while I was having tea the other morning, for I often hear it pecking away in the forested part of the garden. The Diderik Cuckoo is still around, filling the garden with its plaintive, high-pitched calls. Not in our garden, but a very interesting observation from the Prep School over the railway line from our house this week was a Gymnogene being mobbed by a large flock of Redwinged Starlings! This March has been an exceptionally busy month with a lot of work to be done, travelling, and getting home late from work. That I have only recorded 31 species is not a reflection of decreasing bird life in our garden, but rather a lack of opportunity to truly enjoy the birds. 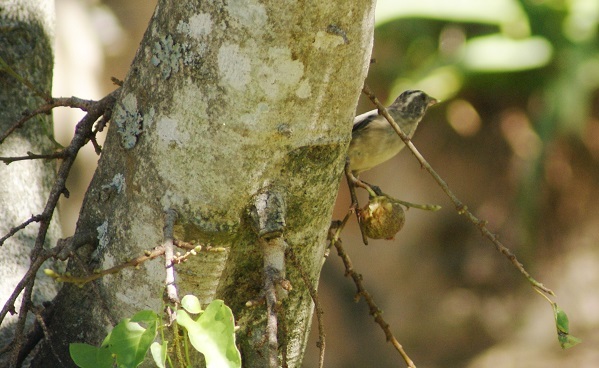 Certainly the early mornings are still heralded with the soft, melodious calls of the Cape Robin and sometimes the distinctive sounds of the Barthroated Apalis flitting through the foliage outside my window. Interestingly enough, the Streakyheaded Canary was the first on my list this month. Outside of aloe blooming season these birds, for some reason, seem to prefer the back garden. 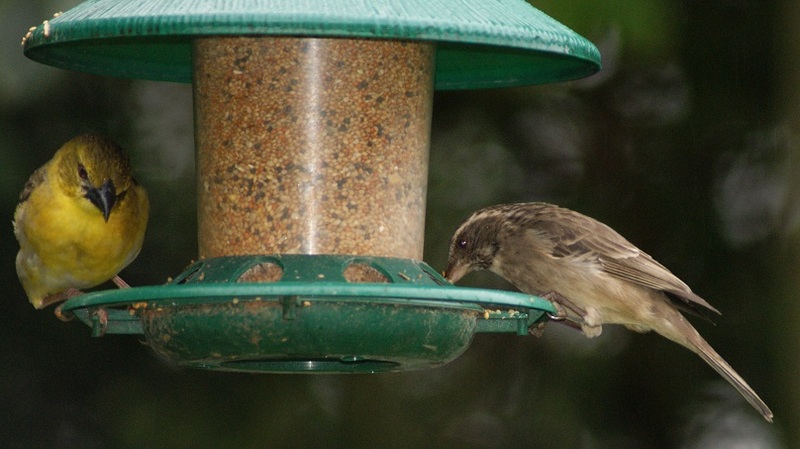 As noted last month, they have started visiting the bird feeder in the front. The dapper Bokmakierie slid into the last position – yes, I am cheating for the month has not ended yet, but I am shortly to be on the road again. 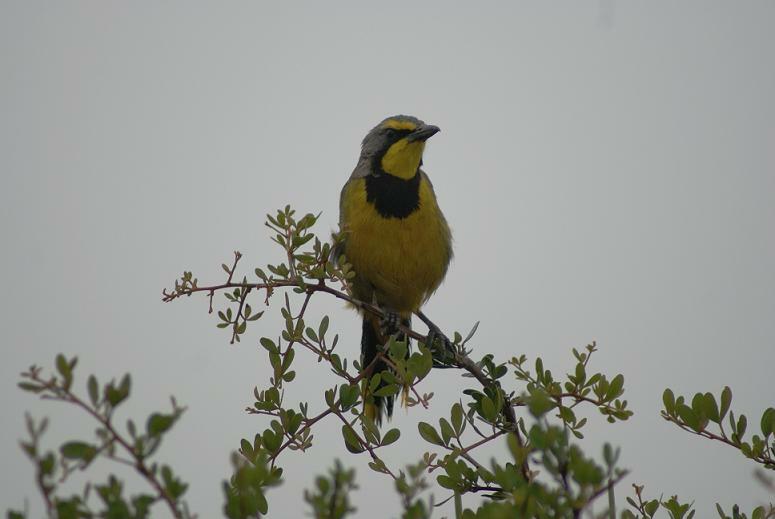 I love listening to the Bokmakierie calling in the early mornings and later in the afternoon and feel very privileged to see one hopping about on the lawn. The mud nest of the Lesserstriped swallows has fallen down from the eaves and these beautiful birds are gathering in increasingly large flocks swooping through the air in the late afternoon light. I will miss them when they go and I am in awe of the long trek they make between continents.